If you have not made a wish list yet your time is growing short but don't fret. 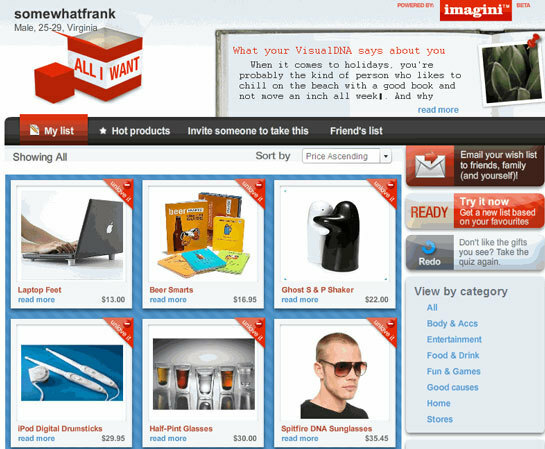 Imagini, not mentioned previously in my wish list round-up, might be able to help you both create personal wish lists in a flash as well as help you come up with gift giving ideas for others. Imagini, a UK-based startup, takes on an interesting approach as it takes on a first time experience similar to Mgnet and then uses a profile to offer recommendations of both people in the community and products or goods. In almost a Stumble Upon fashion users are presented with new people or items to look at they they may have never seen before thus aiding discovery. Imagini has created a sub-product just in time for the holidays that showcases a sample of what they are all about. The sub-product called All I Want (For Christmas Gift Finder) might be able to help you with your personal wish listing and gifting need. By simply selecting a few images which represent your preferences Imagini assembles a recommended wish list. The wish list can be saved and then sent to friends and family. Items on the list can be rated or removed and when you refresh the list new items appear to better match your active inputs. You can also invite friends to create wish lists by going through the same process. If you have been struggling to come up with good gift ideas for someone on your list Imagini might be a good way to find the perfect gift. Finally, check out the hot products as rated by the Imagini community.